It is with a heavy heart that I share with you that the Secret Recipe Club is coming to a close. I met some awesome food bloggers during this time and learned so much from each of them. I wish all the participants the best of luck and hope to work together in the future. I must say thank you to our two wonderful bloggers who kept us organized, Camilla from Culinary Adventures with Camilla and Sarah, from Fantastical Sharing who was the curator of Secret Recipe Club. For this final event, I was assigned Melissa from Smells Like Brownies. Isn't that the cutest blog name? Melissa is a stay-at-home mom, which we all know is a fantastic opportunity for her and her family. She started her blog with the intention of finding the perfect chocolate chip cookie. Through her experiments, she learned a life lesson: variety is the spice of life! There are many shades of perfect and she learned to appreciate many! I love this part of the adventure: snooping through the Recipe Index. I always find so many things to try, and Melissa's blog was no exception. Look at these Sweet Potato Burgers. This Curried Butternut Soup sounds perfect for the fall. And of course, I had to share one of the chocolate chip cookie recipes, here's the Browned Butter Chocolate Chip Cookie recipe. So what did I choose??? When I read the recipe and saw the seasoned milk, it immediately made me think of my Mom's Potato Soup. The seasoned milk in this dish is one of the highlights and made my mouth water just to think of it. I knew I needed to try these eggs. This recipe is copied from the blog. Toast the bread and set on a plate. Butter lightly, if desired. Meanwhile, liberally season milk and bring to a boil in a medium to large pot. When it begins to bubble up, drop in 2 eggs, 1 at a time. Once the milk begins to boil gently for the second time, poach for 2 minutes more. Do not let the milk boil over. Use a slotted spoon to remove eggs from the milk. They will be done once they look solid on the outside. Drop the poached eggs on top of the toast, then pour about ½ cup or less of the hot milk over the eggs. Repeat for the second serving. (It may be ideal to scrape the burned milk from the pan before breaking in the second set of eggs.) There will be extra milk left over after both breakfasts are complete. *Note: These eggs are best warm, so allow to sit for no more than 1–2 minutes before eating. This also means that each person might need to eat separately. I love poached eggs, they are the first egg I learned to cook in home economic. I have never heard of cooking in seasoned milk. I will have to give that a try. I love the idea of poaching the eggs in milk. I've never tried that before but they look lovely - sometimes the very simplest recipes are the best! I have never heard of using milk to poach eggs....pure genius. Can't wait to try it and since there are only 2 of us I need not worry about the first batch getting cold. Thank you for sharing! I love finding new ways to do traditional foods and have never heard of milk poaching. This is definitely something I am going to try! What a unique breakfast!! This looks cozy and filling for a fall morning. Oh my yum! I love all dishes with milk, and I love adding it to soups. Never head of poaching eggs in it but worth the try! Great recipe! Family recipes are the best. I've never thought to do this before but it sure looks like it would make a delicious egg! It's too bad this is coming to a close, but it looks like you had an incredible run! This recipe also looks delicious and something I might have to try soon! I have never tried poached eggs. They do look pretty good though! I love the idea of the Secret Recipe Club too! I am ALL about eggs. And eggs Benedict is my fave brunch meal. But - I have never cooked eggs in milk like this. What have I been missing?! Totally trying this soon... cant wait! This sounds delicious. I have never heard of milk poached eggs but now i am curious to try them. They look so good. Looks delicious! And it sounds really simple to make. I'm no cook but I think I can do this! I never knew you could poach eggs in milk like this! What a delicious breakfast idea! Delicious! I need to poach eggs one of these days! I don't think I have ever had to use seasoned milk in a recipe before. These eggs sound and look amazing! I would love to give them a try. I have never tried making poached eggs with milk before! I love that you are using your dad's recipe, some of the oldies are the best! These are brilliant ideas! I love your list, and I should try it out. Saved this recipe. This is my kind of breakfast! I'm also going to check it out some of your resources, it could be help to fill my breakfast list! Great idea for all the eggs my five hens leave me! Can you seriously just cook for me everyday Terri!??? These look amazing probably because i haven't eaten yet but regardless they look good! I love eggs on toast...we call them Egg in a Hole's. I made them for the first time for my kids last year and they love them. I was shocked they were even loving the runny yolks. I have always tried and failed at poaching eggs so this sounds like something I need to try! Great tips! I love poached eggs! I will have to try this method, it sounds wonderful! 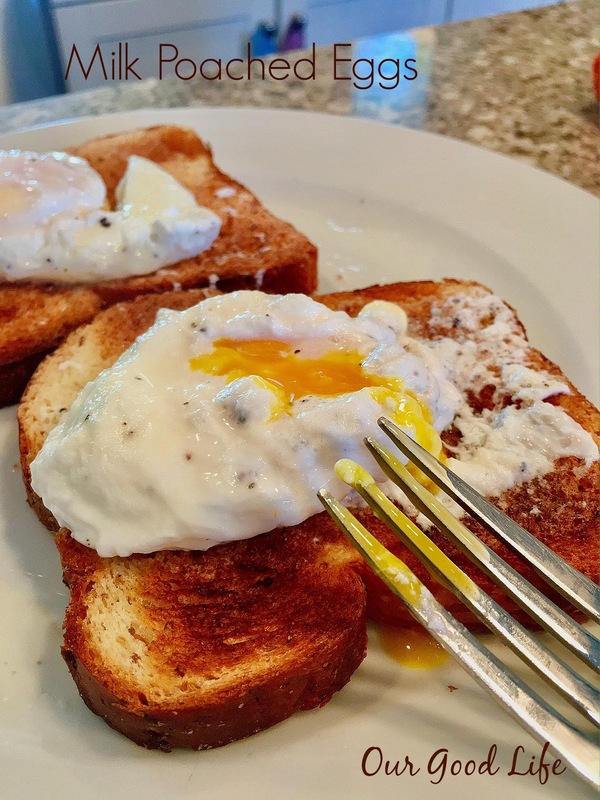 Seriously poached eggs are so good! I just learned how to make them in water this year! I can't wait to try these! Oh my these sound SOOOOOOO good. Sorry to see your cooking club ending. Have a GREAT week. Omg can we say yum?!?! These eggs look absolutely amazing!!! One of hubbies favorite meals that he asks for all the time! These eggs though! I need you in NY asap rocky! Honestly, I just want to try these eggs at home. I'll let you know how it goes. Omg. Terri. Please come be my personal chef. I literally just had cheez-its for breakfast. LOL. But my husband and I buy our eggs in 5 dozen bulk so this would put them perfectly to use! I am not the biggest poached egg fan, but my dad is and this would be a great recipe to surprise him with one morning! Wow! That looks so good, it's a simple but really tasty breakfast! Thanks for the recipe, I've never tried this before. I have never heard of poaching eggs in milk before. What an interesting idea. I bet it adds a bit of creaminess to the dish. I love eggs! It's been a long time since I poached eggs but this sounds so good. I think I know what I'm having for breakfast tomorrow.